Canada Day has crept up on us here at the Club on Langara Island. 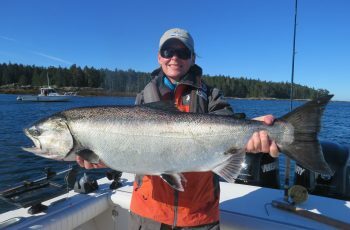 We have sunny skies, calm seas and oh ya, a 45 lb tyee released on boat 18! Four tyees on the day, slower fishing in general, but four tyees we will take any day during our long season. We have dried up a bit on the local tacks, lions out at Cohoe Point, smaller kings, three year olds hanging out at Gunia, so the guides are searching and finding a little farther out. 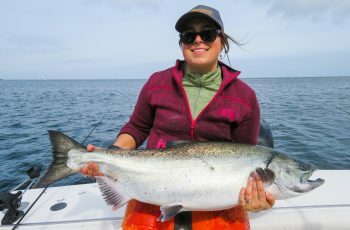 I fished out west and found several 27 lb chinooks, korey shadowing and grabbing his share as well.Hans put in a nice morning with a pair of tyee, at 37 and 45 lbs, what the sam heck is going on? 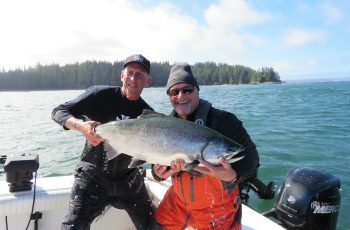 Some of the guides went east chasing strong chickens whatever the sam heck those are, and then continued on to Green Point and found a tyee and a few high twenties. 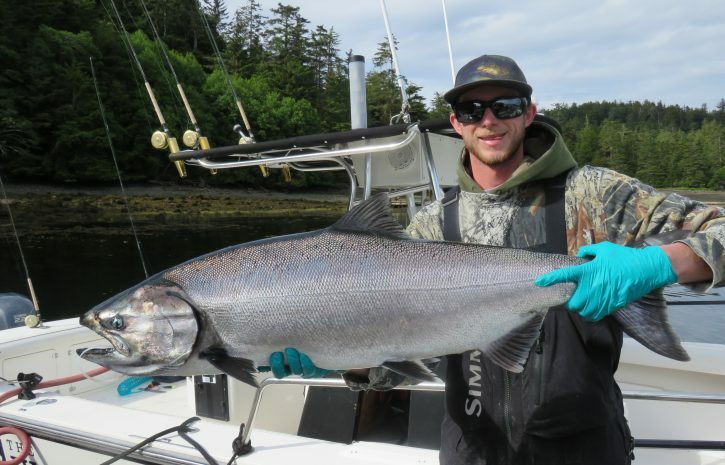 Cliff our dock leader snuck a 28 out from Boulder last tack of the evening for his guests, way to go CLIFF! 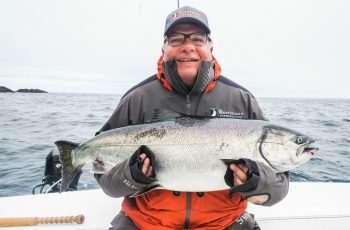 Bud fought fog all the way out west in search of a couple turkeys, find a strong chicken and a pair of turkeys, 22 and 42 lbs….releasing a 80 lb ostrich after measuring in the boat. How did Bud put that one back? Needless to say he is doing laundry tonight. Nothing like smelling strong chicken on your guide pants. Weather is awesome in here, fishing is decent, but slower than early June. 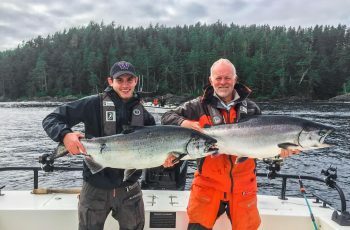 We have had a great month, lots more size and my team of guides here put on a show, claiming most of the 50 lb springs in the area and releasing all of them, now that makes this guide very happy. The pattern seems to be you have to move around a bit, several areas come on the bite and off, just that fast. You need some luck and skill identifying these areas and getting on the program for sure.